Make your imprinted words stand out with this highlighter set! Those who enjoy color-coordinating their notes by subject and topic will go crazy for this highlighter set. 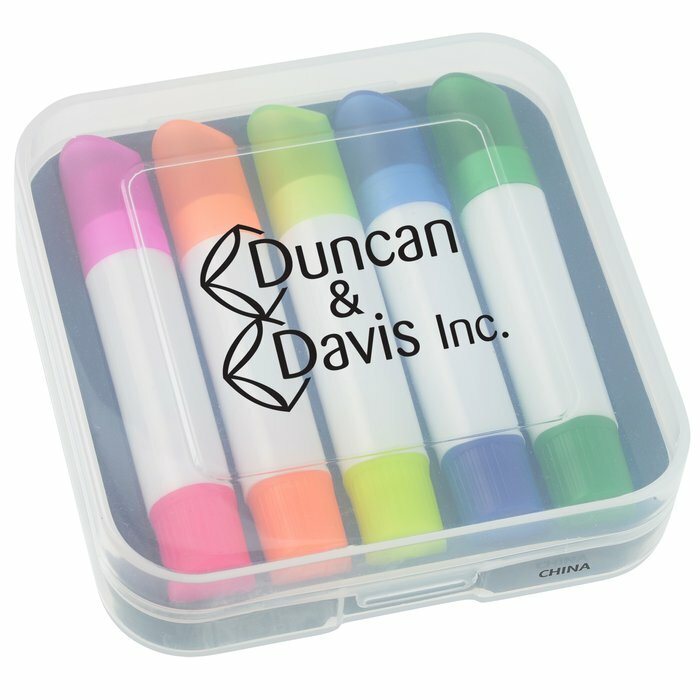 Five compact highlighters nest inside a molded pocket case that easily fits inside a backpack or desk drawer. Unique gel wax highlights over text in a smooth motion and doesn’t smear or bleed. Simply twist the bottom of the barrel to advance the crayon-like highlighter. Trim color matches the highlighter color; colors include blue, pink, orange, green and yellow. Size: 3-1/2" x 3-1/2" x 1".